Videography is far more than learning to operate video cameras. While students at the HIMCOM get the best hands-on technical training possible, they are also taught to be artists with cameras and lights. This program provides students with the opportunity to create projects using digital video (DV) & High Definition Video (HDV). 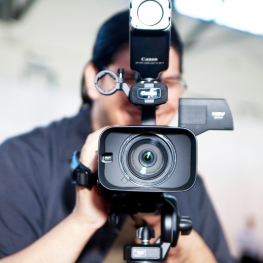 The curriculum provides training in DV/HDV camera technology, lighting for DV, audio recording, and nonlinear editing. Through lectures, demonstrations, and hands-on training, acquire the skills necessary for digital filmmaking. Our faculty of industry professionals guide you through the process and emphasizes the skills needed to produce a quality DV/HDV production from preproduction to final output.